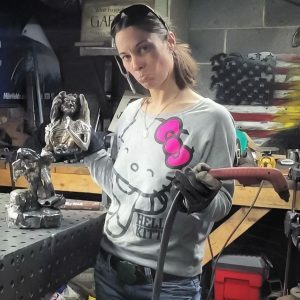 Welding and metal artists and their art. Before she earned her place as one of Instagram’s & YouTube’s welding sensations, Barbie the Welder was just a small town girl shoveling snow around her neighborhood to make a quick buck. From the time she was 7 or 8 years old, Barbie knew the importance of hard work. “My dad always worked hard to provide for our family. I looked up to him. He was funny, rode motorcycles and always had me by his side when he was working around the house. He taught me so many things and was the catalyst for my love of building things and working with my hands,” says Barbie. Little did she know that one simple scene would change her life forever. For most people, the Tom Hanks’ movie, Castaway is just an iconic movie. But for Barbie the Welder, it was the spark of inspiration that set her on the course to find her purpose and pursue her destiny. 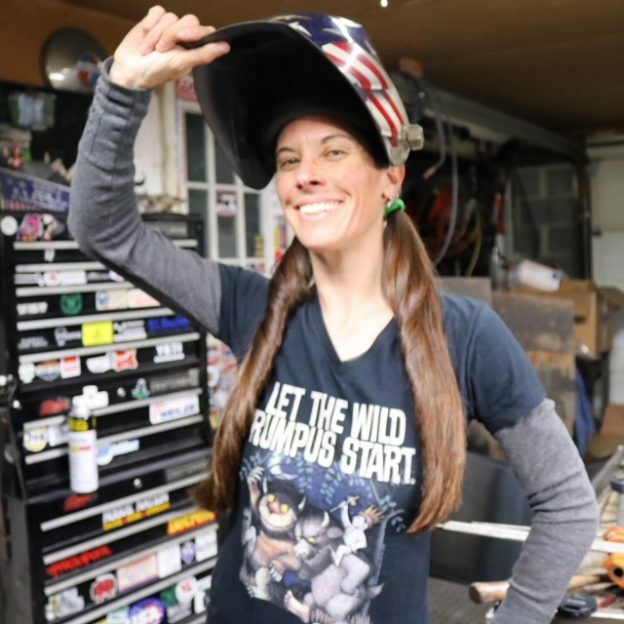 Barbie says, “I saw the woman in the beginning of the movie welding giant angel wings, and it spoke to my soul.” For the next nine months, she saved every extra penny she earned from metal hauling to put herself through a $1200, 6 month, 104 hour adult welding class. Without really knowing where they would lead, Barbie began her courses in the hopes of becoming a sculptor. What happened next was a welcome surprise. 3 ½ years later, Barbie earned enough money to buy her family a nice house with a garage large enough to convert into a metal shop. It took 9 more months to save money to purchase the machines, but the wait was worth it. Here at Arc-Zone, we’ve identified Barbie as a source of inspiration; what makes her even more real, is Barbie’s honesty and openness to sharing her struggles. 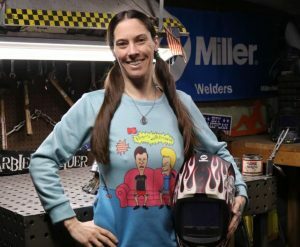 If you don’t follow her on Instagram @BarbietheWelder, you’re missing out. Not only does she showcase her incredible talent, but she shares the trials and errors of working with metal. Often, projects don’t turn out exactly how we want them, and Barbie shows us that persistence and determination are really the only secrets to making improvements in our work. Challenging ourselves and staying committed can lead to our best work. It all starts with personal responsibility. What advice would you give girls/women looking to enter into the trades industry? If it’s what you really love, go all in! 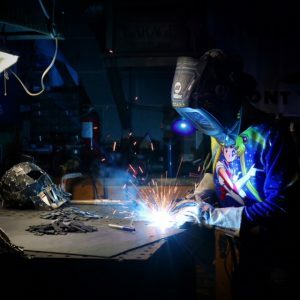 Welding has given me good self-esteem, improved my financial situation, and allowed me to create opportunities for myself that I never imagined! What are the hardest hurdles to overcome in the welding industry? 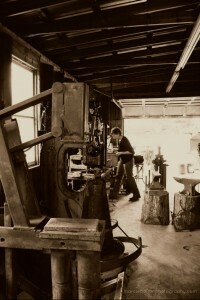 I feel that getting the education that I wanted, in the fab shop I worked at, was a challenge. What are your favorite welding tools to use? My mind is my favorite tool! If it has to be welding, I would say my MIG because it’s so versatile! What brands of safety gear/apparel are your favorites? Any safety gear is my favorite because I love my face and fingers right where they are! When it comes to welding, I only use Miller Elite hoods! Super durable and great features! What do you love most about welding and fabrication? I love seeing a picture in my head and being able to form, shape, and bend metal to create it. The only limit is my imagination! How do you best learn new skills? I learn new skills by jumping in and trying, I’m a hands on kind of person. Lastly, it’s pretty cool that your career is what some people are only lucky to have as a hobby, what do you do outside of work for fun? 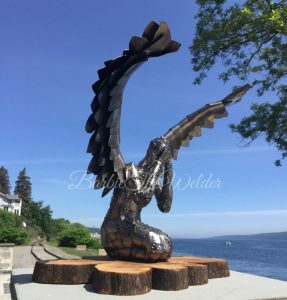 This entry was posted in New Rosies, Welding Art, Working Women & Society on August 22, 2018 by Editor. This entry was posted in TIG /GTAW Welding, Welding Art, Welding Tips on September 14, 2016 by Carmen. That’s Joanie under that mask! 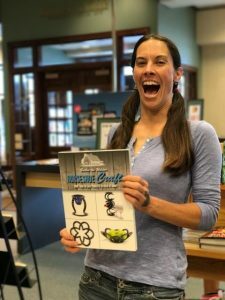 You may know Arc-Zone’s Joanie Butler from the phone– she may have helped you put your welding supplies order together as part of our team, or she may have answered a technical welding question for you over email. When Joanie is not serving as Arc-Zone’s Pro Account Manager, she is working on her metal art. 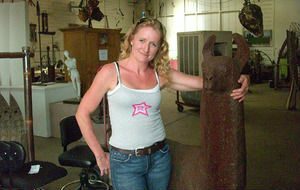 Joanie is known for taking scrap metal and turning it into amazing art. She has a fondness for critters, from dogs and owls to starfish and spiders. Check out her work on Instagram, you’ll be amazed. 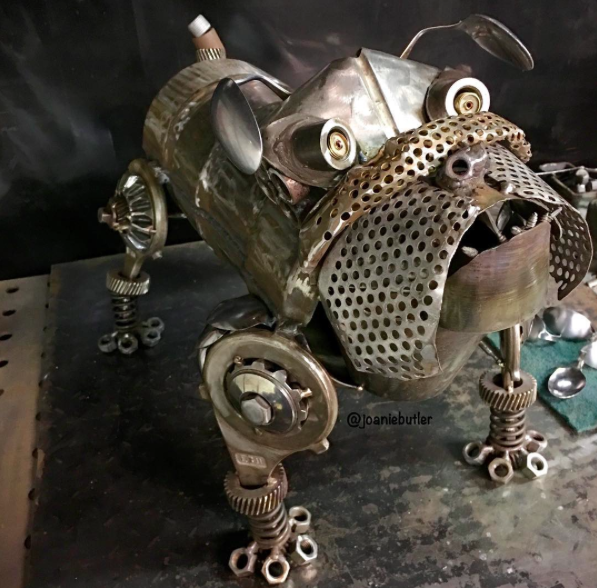 One of Joanie’s recent projects was welding up this little bull dog for Aaron Biefer, owner/operator of Bulldog Welding in Holly, Michigan (check out his work, @BulldogWelding on Instagram). This entry was posted in New Rosies, Welding Art, Welding Education, Welding Fun on June 6, 2016 by Carmen. Darlene Kerns has always been mechanical. “My dad had me working on cars when I was a little girl,” she says. In fact, her dad told her if she couldn’t fix it she couldn’t drive it—great incentive to learn. Darlene’s first job was working in an auto body shop. “Metal art is all I do now,” Darlene says, and she’s been able to make a living with her art. She mainly works with oxy- acetylene because most of the metal she works with is recycled. For anything over 1/32-in. 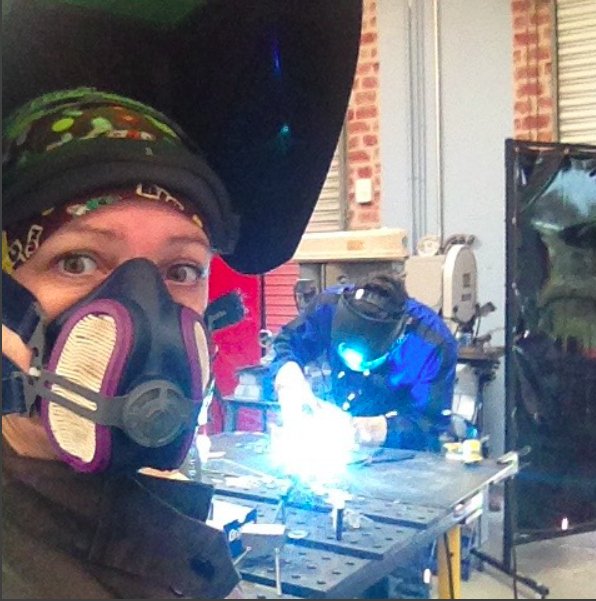 or for functional pieces for structural support, she MIG welds. This entry was posted in New Rosies, Welding Art, Welding Tips on May 17, 2016 by Carmen. Jaclyn Davidson is not a welder, but she does work with metal and solders some amazing jewelry. 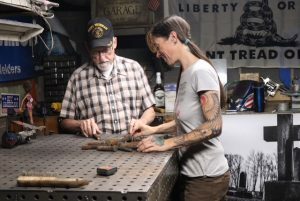 She started out working with gold, but for the last ten years she has been working with weathered carbon steel, turning it into jewelry that is showcased in the Smithsonian and the Museum of Art and Design (MAD). Her work has received “best of show” in venues along the east coast, including the Philadelphia Craft Show in 2005. My work received the Verdura prize in 2007. She is represented by Charon Kranson at SOFA. “My work uses the most rusted beautiful carbon steel there is in the junk yard and it is worn to places of high esteem,” Jaclyn says. 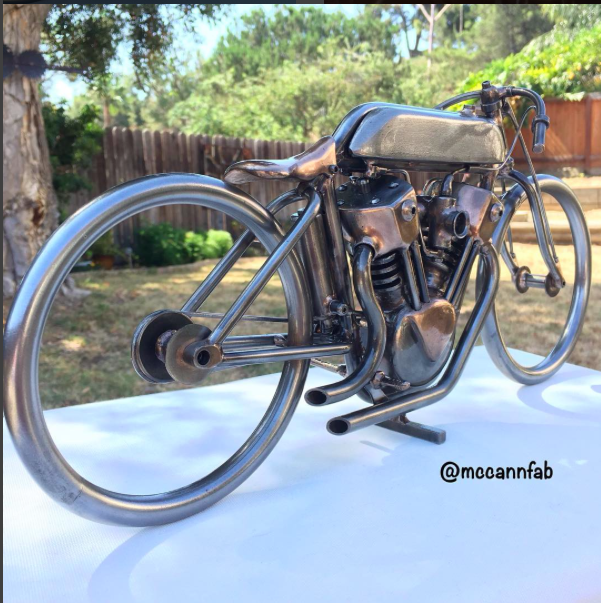 This entry was posted in New Rosies, Welding Art on March 4, 2015 by Carmen.